Operational building blocks and data analytics yield benefits for patients and providers alike. Hospitals and health systems generate and capture massive amounts of data from sources as disparate as patient records and information from accounting, pharmacy, and admissions, discharge, and transfer systems. The question is how to best use these data to improve care, reduce costs, and optimize performance. The dilemma becomes increasingly urgent in light of the government mandate to establish and utilize electronic health systems as well as lower reimbursement rates stemming from the Affordable Care Act. Fixed bundled payments for particular diagnoses put a premium on efficiency to minimize the length of patient hospital stays. The imperative to mitigate hospital readmissions—especially within 30 days—demands not only careful data-driven discharge decisions but also diligent follow-up to ensure that patients comply with medication regimens and doctor appointments. Aiming to improve care, lower costs, and maximize performance, hospitals and health systems can employ several proven strategies—or “building blocks”—to achieving those objectives. • Accountable care organizations: “ACOs are basically a shared risk-and-reward system to reduce costs and improve quality,” Perez says. ACOs, which may include hospitals, physician practices, nursing homes, and rehab centers, will be eligible for a profit-sharing bonus at the end of a certain period if they achieve their objectives. Optimal sharing of actionable data is critical in these efforts. • Value-based purchasing: “In a value-based purchasing program that takes effect October 1, Medicare is going to hold back 1% of reimbursement,” says Herb Smaltz, PhD, CEO of data analytics vendor Health Care DataWorks. Hospitals and health systems that perform well on certain key performance indicators are eligible to regain some portion of the withheld sum. • Bundled payments: Hospitals and health systems receive a bundled payment, or fixed dollar amount, for a specific diagnosis. Healthcare providers must therefore find cost-saving efficiencies lest their profit margins become squeezed. One way to accomplish this is to minimize the length of patient hospital stays and monitor follow-up to prevent readmissions. • Hospital-acquired conditions: Hospitals must redouble their efforts to prevent conditions such as infections or iatrogenic mishaps. “Hospitals are bad places for patients,” says Glenn Appelbaum, senior vice president of operations at IPC, The Hospitalist Company, whose statement is backed up by statistics from the Centers for Disease Control and Prevention that show approximately one in 20 hospitalized patients will contract a healthcare-associated infection. Close coordination between hospitals and primary care physicians or specialists is paramount. “We know that sometimes when you get people out [of the hospital], they are not transitioned back to their primary care doctor or cardiologist or nurse navigator,” says Evon Holladay, vice president of business intelligence at Catholic Health Initiatives, a nonprofit health system in Englewood, Colorado. “And so they end up coming back. And they come back in worse shape than when they were there the first time, so they end up staying longer.” Meanwhile, costs escalate. To achieve optimal use of actionable data and thereby provide better care while reining in costs, hospital and health system administrators can utilize six building blocks to develop effective data analytics, according to a recent white paper by Jared Rhoads, a senior research specialist for Computer Sciences Corp. The idea is to find new strategies to use data in productive ways. It’s important to involve physicians, nurses, and other key care providers in decisions to obtain and maintain a database that provides near-real-time actionable data. “You have to include physicians not only in the gathering of data but also in their analysis and modification,” Appelbaum says. Today’s hospitals and health systems maintain enterprise data warehouses containing traditional structured data and increasing sources of unstructured information from disparate sources. Structured data derive from electronic formats that the user fills in according to strict limits, while unstructured data refer to anything collected in a free-form manner. The latter set may derive from patients and home monitoring systems as well as caregivers. There also will be healthcare data from primary care physicians, specialists, and hospital care providers. The goal is “to create a holistic view of your health,” says Holladay, whose health system puts a premium on maintaining a continuum of care across providers with an emphasis on wellness and disease prevention. To optimize the data’s value, hospitals and health systems must establish relationships and collaborate with other data sources to encourage data sharing among disparate healthcare providers. One approach to data sharing involves “virtualizing” selected data from multiple sources or facilities. Cloud computing can be a cost-effective way to transport large amounts of data onto a temporary platform. This approach can help trim data infrastructure costs because health organizations pay cloud service providers only for the computing resources they use. In this way, hospitals and health systems can avoid large capital outlays for servers. “It’s really the operability that suffers when you don’t have data standardization,” Rhoads says. “Because you might have organizations that are collecting information about the same types of events and because they’re doing it with different formats, you can’t compare them and you can’t combine them.” Standardizing formats improves the quality of shared data and allows for interoperability. While much progress remains to be seen in data standardization, many hospitals and health systems have a head start by implementing systems that allow data from medical devices to instantly populate the EHR. “It’s just much more efficient to do it that way,” Rhoads says. This step merges data from internal and external data sources—presently maintained in “siloed” data warehouses specific to separate patient care, financial, and other systems—into a single patient-oriented data format. For example, a hospital or health system may wish to aggregate patient demographics, conditions, procedures, drugs, and operations from an EHR. Lab values and diagnostic findings from other clinical systems help to fill in a more complete picture. Operational and financial analyses are included as well. Call this the Emerald City of data optimization, the destination to which the previous pathways were leading. Now that large amounts of data have been gathered and standardized, it’s a matter of analyzing them in a way that’s most useful to doctors, nurses, and administrators. Predictive analytics go hand in hand with preventive medicine. “So with the healthy people, how do we keep you healthy?” Holladay says. “For the people with one disease condition, how do you keep them from having multiple disease conditions?” This strategy emphasizes regular primary care checkups to detect and monitor risk factors, signs, and symptoms of incipient disease. In an increasingly competitive healthcare market, data-driven hospitals and health systems enjoy advantages over organizations that take an ad hoc approach to information management. The cost-efficiencies that come with managing and analyzing data in a standardized homogenous format figure to pay off compared with a loosely organized catch-as-catch-can approach. The payoff comes not only in reduced overall costs but also better patient care and optimal administration. — Robert J. Murphy is a Philadelphia-based freelance medical journalist. 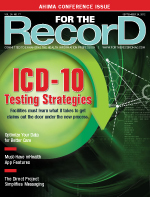 The University of Wisconsin’s (UW) academic medical center and health system, UW Health, implemented an EHR only to find it was difficult to harvest meaningful information from the reporting database. Owing to certain complexities and quality problems with the data, users spent more time extracting, transforming, and loading data than analyzing them and taking action accordingly. Assisted by Computer Sciences Corp, UW Health established an HIM center with experts in data warehousing and business intelligence. The key priorities were to devise plans for data governance, quality, and standards. The data governance strategy provided accountability for information quality by having data users approve business measure definitions, formulas, and business rules. Automated tools improved data acquisition to manage tasks such as loading and error checking. Also implemented was a data “mall’’ consisting of numerous interconnected data “marts” that allowed quicker access to consistent information across the organization. Overall, these technologies are meant to support UW Health in its efforts to become a data-driven organization. Last year, Blue Shield of California (BSC) worked with HIT vendor MedeAnalytics in an effort to leverage the power of data analytics. Now, BSC enjoys access to a Web-based analytics portal that consolidates claims data and yields the opportunity to improve healthcare utilization and its financial metrics. Thanks to interactive dashboards, reports, and analyses, executives can collaborate in spotting trends, problems, and outliers. The project brings together disparate data sources and generates composite performance indicators with virtually no lag time or capital investment, according to a MedeAnalytics white paper. The initiative also improves consolidation among some 200 contracted provider groups, with the ultimate aim of ensuring quality, efficient patient care for BSC’s members. By using this information, BSC-contracted medical groups can spot a problem, explore a solution, and intervene to resolve the matter. Portland, Maine, is the home of what is believed to be the nation’s largest statewide health information exchange (HIE). HealthInfoNet, which encompasses the state’s four largest health systems, 15 hospitals, and some 2,000 physicians, is expected to save up to $37.2 million in avoided services and $15.6 million in productivity savings. Before HealthInfoNet, the need for a statewide HIE was evident. Most clinical information was stored in paper medical records or unconnected hospital-specific electronic systems. Caregivers had difficulty gaining access to patient records and sharing data across unaligned organizations—a problem all the more pressing in emergencies. Working with Orion Health, DrFirst, and 3M Health Information Systems, HealthInfoNet went live in 2009. Now, providers enjoy quick and efficient real-time access to key clinical information. Among the accessible data are patient identifiers and demographics, encounter histories, lab results, radiology reports, patient-consent management, adverse reactions and allergies, medication histories, diagnoses/conditions/problems, and dictated and transcribed documents.